Hello Hello! I have one of the new Fergie by Wet N Wild to show you today. This is Ferguson Crest Syrah. 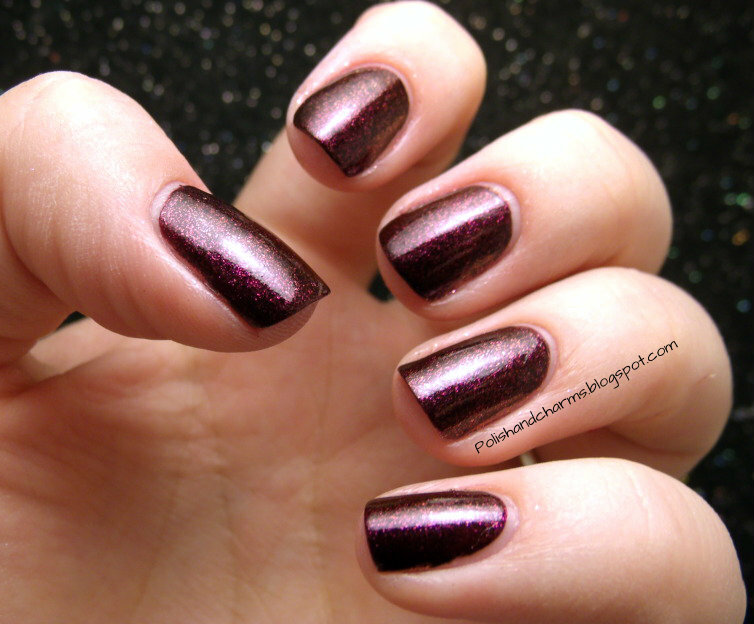 A really pretty burgandy with gold shimmer. Unfortunately, the gold didn't really transfer onto the nail. Still pretty though! What you see is 3 coats. Enjoy! Ooh love this! I've bought a few for gifts but none for myself yet! Oooh, this is really pretty! This looks so pretty on you! It's lovely! The shimmer may look a little more subtle than in the bottle, but this is such a beautiful colour! Deep but not vampy, still shimmery and textured. I really like this one! I like it too even though I would like to see a tad more gold! I was surprised to find them myself! They were hidden away from the polish section of my Walgreens! Such a pretty color for Fall! Isn't it! I think it will be good for layering! This is really pretty! I wish the gold showed on the nail more, though!